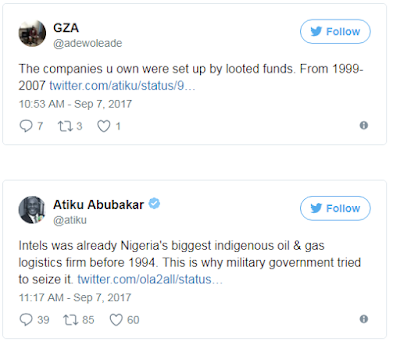 Former Vice President, Abubakar Atiku on Thursday listed some of his companies in a tensed twitter conversation over allegation that he owned Mikano, the generating plant company and may end Nigerian up in darkness should he become President in 2019. 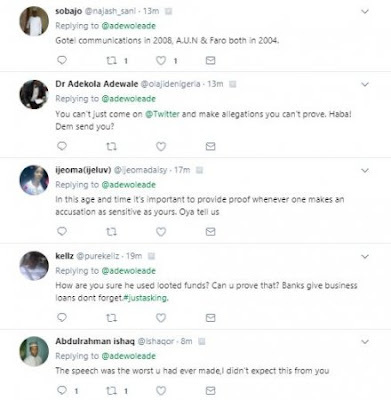 A twitter user, @adewoleade, has accused him that the companies he own were set up by looted funds from 1999 to 2007 when he was the country's vice President. Another user, Sobajo‏ @najash_sani said Gotel communications in 2008, A.U.N & Faro were both funded in 2004. The former vice president listed some of his comapnies as NICOTES (now Intels) founded in 1989., Prodeco, 1996, his farm, 1982 and ABTI schools, 1992 . 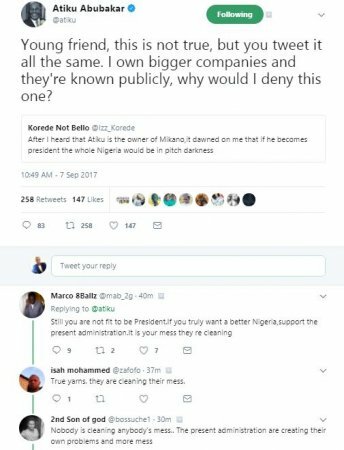 Even if it was true, you don't expect him to admit naaw.. niaja politicians are sharp. Thank you jor my brother. Lol.. How many politician can list all their coys.. Even buhari didn't make his asset declaration public.. Atiku has just earn a point there jare.. He listed just some not all, lol I smell foul play. With those alleged companies who did epp? Hahahaha, them epp themselves o. We should know he's defending his interest for presidential election.